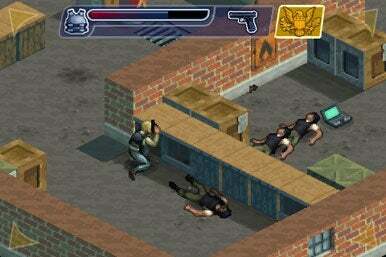 24: Special Ops—a $5 violent shoot-’em-up for iPhone and iPod touch based on the hit TV series—tries to do too much. It’s heavy on carnage, to be sure, but it’s also rife with mini-games, which is an experience as bizarre as it sounds. The game is fun, but almost campily so. Gameplay frequently doesn’t take advantage of the iPhone’s unique abilities, and it’s matched with subpar, blocky graphics and sometimes tediously repetitive challenges. The game from Digital Chocolate is OK, even amusing at times, but not especially re-playable. Shoot First, Ask Questions Later: As you might imagine with any game involving Jack Bauer, the body count rises quickly in 24: Special Ops. When you jump into the game itself, things aren’t much better. The first level (which, as Kiefer Sutherland himself tells you in voiceover, “takes place between 11 a.m. and 12 p.m.”), offers an in-game tutorial that explains what you’re supposed to do. And it does take you through all the main controls and elements of the game—for better or worse. You’ll quickly get introduced to the poor graphics: very unnatural character movements, polygons mincing around the screen, and constantly tiled, textured backgrounds. The control scheme, while functional, also seems lacking: You press and hold in one of the four corners to move in that direction, and tap in the center to shoot. It works, but it just doesn’t feel very iPhone-ish. The core objective in 24: Special Ops, not surprisingly, is to kill all the bad guys. You can tap repeatedly to shoot, or press and hold to fill up a “headshot meter” which blows away terrorists in a single shot—but, of course, leaves you exposed longer. The game quickly becomes a test of patience; you’ll spend a lot of time “loading up” a headshot while an enemy’s taking cover, waiting to “release” and fire once he finally pops up. Over and over again. There are various power-ups and treasures to grab as you explore each level. Over time, you’ll score new weapons, like the hilariously-defined automatic machine gun. It’s automatic—I swear—in the sense that it automatically fires upon enemies when they’re within range without your asking. Grenades can be lobbed wherever you’re aiming to blow up anyone nearby. Finding bulletproof vests refills Jack’s damage meter. Oh, and the game also tasks you with collecting as many laptops as you can. Presumably, Jack has big pockets. Riddle Me This, Jack: Remember that episode of 24 where Jack Bauer solves word scrambles? Those are some of the mini-game challenges in 24: Special Ops. In between killing terrorists, 24: Special Ops presents you with an assortment off silly mini-game challenges. 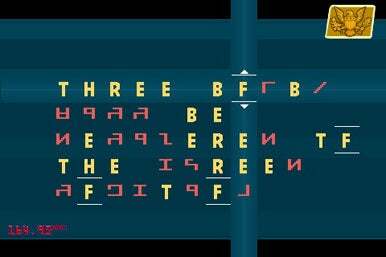 You decipher those encrypted e-mails by swapping out letters, like a cryptogram, until the message makes sense. It’s a silly substitution game, and seems like something Jack would never do on 24—and it’s certainly a mini-game he would never play, in spite of the pounding, dramatic soundtrack that blares while you do it. You pick locks with goofy speed-reflex games. On occasion, you must speed through a rod-straight highway, steering by tapping the edges to avoid other cars, and braking by tapping in the center. 24: Special Ops is compatible with any iPhone or iPod touch running the iPhone 2.1 software update.